Television Critics Association Press Tour, Pasadena, CA, January 14, 2013 – This fall, PBS KIDS will premiere PEG + CAT, a new animated preschool series that follows the adorable, spirited Peg and her sidekick Cat as they embark on adventures and learn foundational math concepts and skills. Co-creators Billy Aronson (Rent, Postcards from Buster) and Jennifer Oxley (Little Bill, The Wonder Pets!) have teamed with The Fred Rogers Company to bring young viewers a new way to experience math through Peg and Cat’s relatable, and often hilarious, adventures. This multiplatform media property premieres this fall on PBS KIDS with a special one-hour broadcast of two back-to-back episodes, along with integrated online and mobile content. Each episode features fascinating stories in which Peg and Cat encounter a problem that requires them to use math and problem solving skills in order to move forward. The series will air daily following its premiere (check local listings). The PEG + CAT television series is part of a multiplatform media experience that will also include interactive content online and on mobile. The series currently offers games and other resources online at pbskids.org/peg, and additional interactive features, including more games, parent resources and a mobile app, are slated to launch along with the on-air premiere in fall 2013. Every half-hour episode of PEG + CAT will feature two stories, each an eleven-minute adventure in which Peg and Cat find themselves thrust into an unexpected math word problem. But it’s not just an abstract academic exercise for them — it’s a messy and funny quandary they have to solve. The show focuses not only on helping kids build math skills, such as how to add or subtract, but on how to think about larger math concepts as well — concepts that form the foundation for learning math at any level, from kindergarten to calculus. In each episode, Peg and Cat use foundational concepts like relative size, geometry and algebraic thinking to solve the problem and save the day. The series’ curriculum is based on Common Core State Standards. 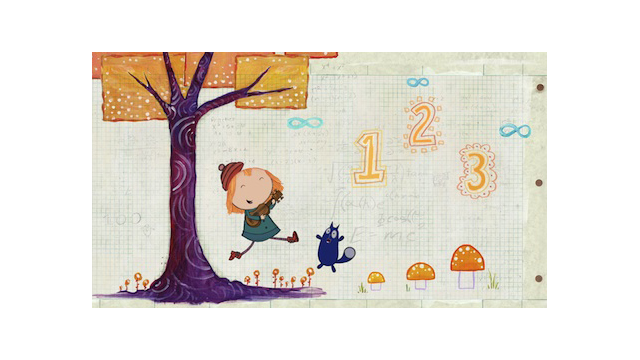 Peg and Cat’s adventures take them through worlds of infinite possibilities — from farms to purple planets, from 16th-century Verona to New York’s Radio City Music Hall, from a land of pirates to a prehistoric valley — demonstrating that math is everywhere. PEG + CAT stories are at once engaging, appealing, accessible and age-appropriate. As Peg solves a seemingly insurmountable problem, she has to think through what went wrong and how she can get back on track. Life skills such as cooperation are also important parts of the series, as Peg and her friends have to work together to solve problems; and since Peg might not get it right the first time, viewers also see value of learning from mistakes and experimentation. Music is also used as a teaching tool throughout the math series; each episode features an original song. PEG + CAT is funded in part by the U.S. Department of Education through the Ready To Learn Initiative, a program that supports the development of innovative educational television and digital media targeted at preschool and early elementary school children and their families, and by the Corporation for Public Broadcasting (CPB). About PBS KIDSPBS KIDS, the number one educational media brand for children, offers all children the opportunity to explore new ideas and new worlds through television, online and community-based programs. For more information on specific PBS KIDS programs supporting literacy, science, math and more, visit PBS.org/pressroom or follow PBS KIDS on Twitter and Facebook. About The Fred Rogers CompanyThe company was founded by Fred Rogers in 1971 as the nonprofit producer of Mister Rogers’ Neighborhood for PBS. In the years that followed, it not only created hundreds of episodes of this much-loved program, but also extended Fred’s values and approach to other efforts in promoting children’s social, emotional and behavioral health and supporting parents, caregivers, teachers and other professionals in their work with children. The Fred Rogers Company continues to build on Fred’s legacy in innovative ways through a wide variety of media, and engaging new generations of children and families with his timeless wisdom. For more information, visit us at www.fredrogers.org. About CPB The Corporation for Public Broadcasting (CPB), a private, nonprofit corporation created by Congress in 1967, is the steward of the federal government's investment in public broadcasting. It helps support the operations of more than 1,300 locally-owned and -operated public television and radio stations nationwide, and is the largest single source of funding for research, technology, and program development for public radio, television and related online services. About The Ready To Learn Initiative The Ready To Learn Initiative is a cooperative agreement funded and managed by the U.S. Department of Education's Office of Innovation and Improvement. It supports the development of innovative educational television and digital media targeted at preschool and early elementary school children and their families. Its general goal is to promote early learning and school readiness, with a particular interest in reaching low-income children. In addition to creating television and other media products, the program supports activities intended to promote national distribution of the programming, effective educational uses of the programming, community-based outreach and research on educational effectiveness.